The Friends of Kelvingrove Park aim to maintain & enhance architectural and environmental features in one of Glasgow's oldest and most popular public parks. Please browse around our site, join the Friends, see park features on this map or leave a message in our guestbook. Also, feel free to of any forthcoming Glasgow events. Along with representatives from other parks, the Friends of Kelvingrove Park have attended workshops as part of a consultation process about parks and green spaces across the city. You can view an early draft report on those workshops, and the full report produced by Pidgin Perfect for Glasgow City Council, should be completed soon. Friends of Kelvingrove Park also has representation on the Glasgow Parks Forum which has the potential to be a useful bridge between parks managers and parks users. 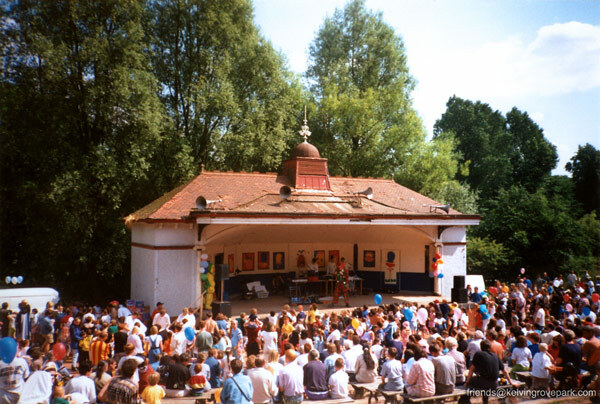 Comments regarding Glasgow Mela	should be directed to events@glasgowlife.org.uk or by phone to 0141 287 4350. Comments regarding other events should be directed to lesevents@glasgow.gov.uk Glasgow City Council, Land and Environmental Services. For Out of Hours (5pm-3am) noise complaints please contact 0141 287 1060 (7 day service, visit this page for more info). KELVINGROVE	BANDSTAND HISTORY - After many years of neglect, the Friends of Kelvingrove Park started a campaign to save the bandstand, which was then subsequently restored by Glasgow Building Preservation Trust with a great job done by the architects, funders and the contractors on the renovation. The venue is now being run by Glasgow Life with a mix of community and live music events. 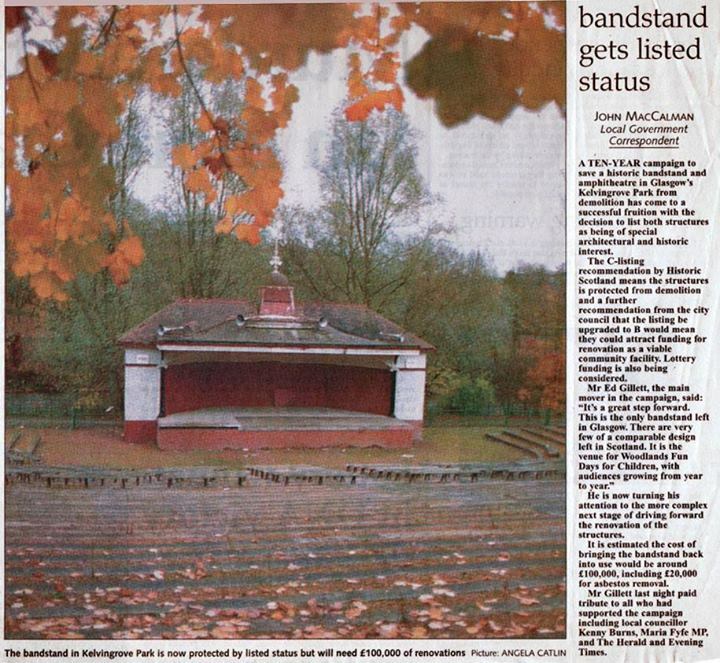 You can read more about the Bandstand's history via this website. See our News Archive or go to our Facebook Page http://www.facebook.com/kelvingrovepark for latest stories and photos. Please browse around our site. You can also join the Friends or like our page on Facebook. Please if you have any further enquiries, or news of forthcoming events in the park. All site contents are © Friends of Kelvingrove Park 2018 unless otherwise stated.